In some ways, I was never a very good student. When I was around 12 years old, one of the biggest problems I had in school was that I would always forget when home work was due, or days we had tests. I remember I’d arrive at school and my friends would ask me if they could see the paper I had prepared for a given assignment that was due that day… and then I’d realize I hadn’t written the paper at all. Or they’d ask if I had studied for a given test… only that I hadn’t, because I forgot we had the test that day. It was a constant struggle – I’d have to rush and write a paper just before class (in the days before typewriters or computers, and when copying text from a book was what passed as “writing a paper”), or try and memorize as much of a subject as I could before a given test. At some point I realized the obvious: it was impossible for me to remember everything I had to do for school. It wasn’t a matter of distraction: I just had so much going on in my mind that it was just very easy to forget everything besides my current task. Inspired by a school friend, I came up with a solution: I reserved the last page of my school notebook for a list of tasks, with one line for each assignment. Each line described the task, the date it was given to us, the class, when it was due, and whether it was already completed. It was a rather simple list, but damn, did it work. My assignment/test miss rate – which was nearly 90% before – dropped to about 0% after I started using the list. I’d always check the list at home, at night, and do the assignments that were due for the next day, or study for the tests we were going to have. It was a big lesson for me, and an interesting example of how a simple, crude model could have a huge impact in my productivity. I see the same pattern in the work I do today. If I don’t make a list of things I need to do, they’re bound to be forgotten. It was with utter surprise that, when I started college, I noticed many of my colleagues suffered from the same problem – they’d just forget they had something due. I suppose they came from a school where they didn’t have home assignments, and therefore never had to keep a list before. They were learning that in college. And I suppose many people never do. 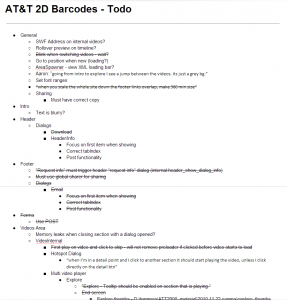 There are many tutorials and articles on how to create an efficient to-do list. Personally, I feel that there is no single way to do it; I’ve noticed over time that different people like to have different kinds of to-do lists. Depending on their structure, they seem to reflect specific mental models; some people will swear by a list format, some people will hate the same format. People also create lists for different kinds of goals, of course, and some goals align better with structures of their own. For me, there are two different models I like working with. The first one is a good, old, paper-based to-do list. I do that by listing all the tasks I have for a given project or goal. As I complete them, I draw a line over them, which is very satisfying. I frequently add new items, sub-items and groups of items to the list, too. I normally use discardable pages from a notebook for that. 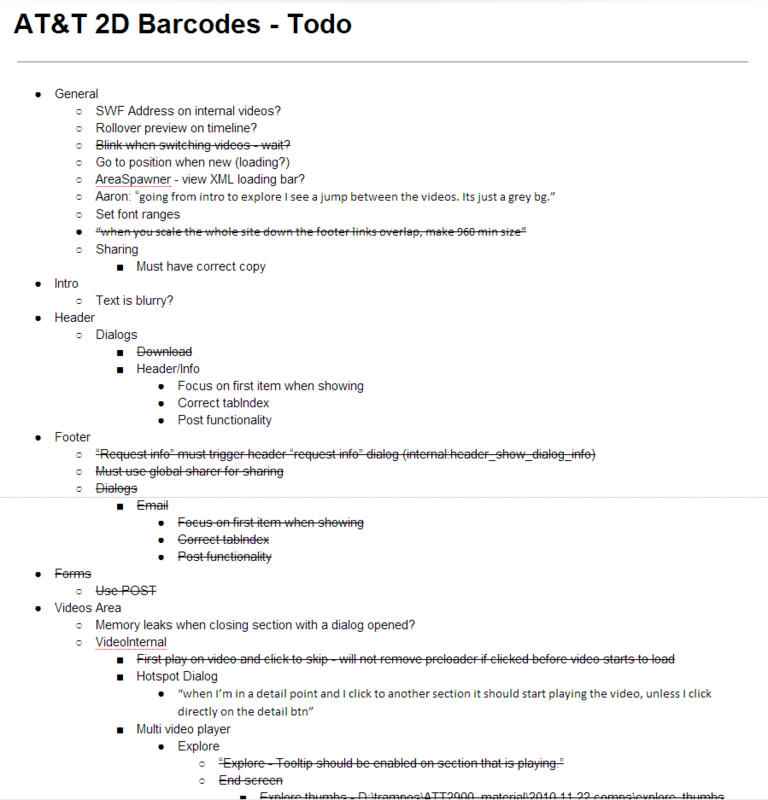 After a few days of use, the list is a mess, with a lot of dead content (things that were done) and text that was added later and is struggling to fit into a small amount of space. When my list starts to become unmanageable, I just rip the page off the notebook, re-write it – with just the items that I still have left on it – and throw the old page away. 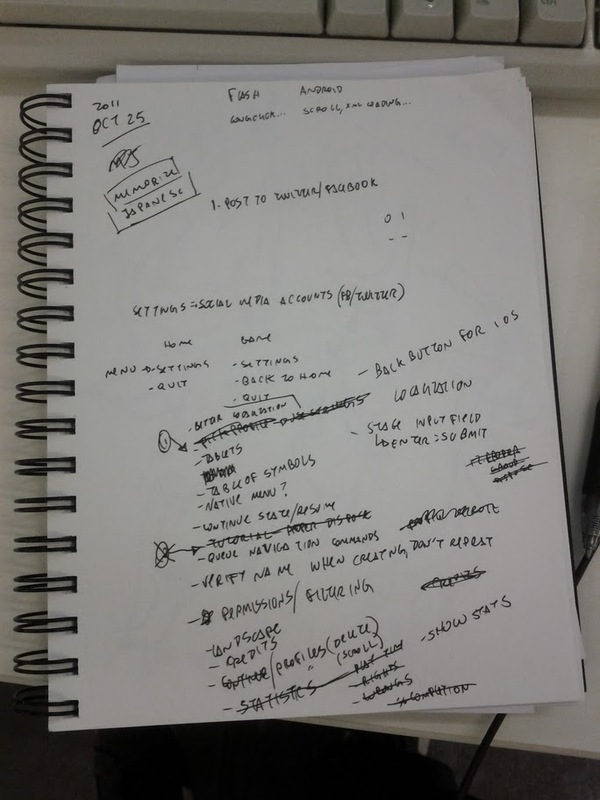 There’s a good amount of satisfaction in that, too; not as much in throwing a page away, but rather in creating a new, better-looking, small list of to-do items, starting fresh – even if I know it’s going to get out of control after a while again. 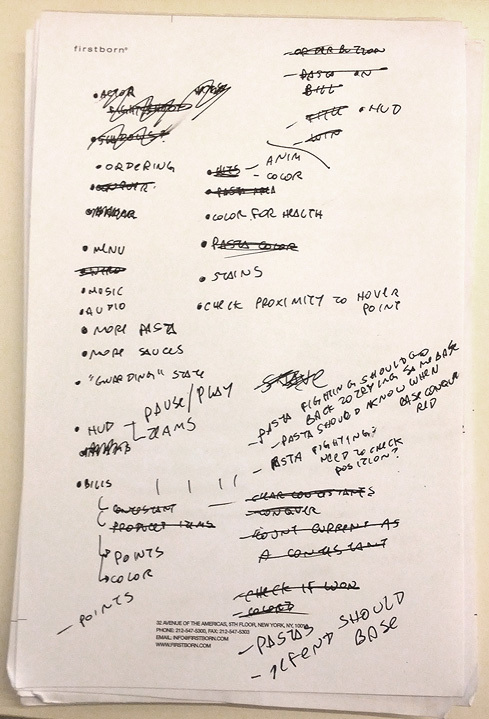 Re-listing the items also helps me visualize the full scope of the tasks that I have ahead of me, and that’s when I decide which items should be prioritized over others. It’s often that I feel lost in a project, not knowing what I should do next, because the actual list of things to be done is massive. When that happens, I just look at the list and make scratching off that one next line my goal for the day, or the next few hours. It’s a ridiculous quest reward, but the satisfaction in accomplishing that goal and seeing a list of things that I’ve done gives me some kind of validation that makes it all seem worth the effort. It’s silly, but the brain works in silly ways. The interesting aspect of that is that I find this workflow to be much more efficient than keeping a list on any to-do list software or website, no matter now many features it may present. 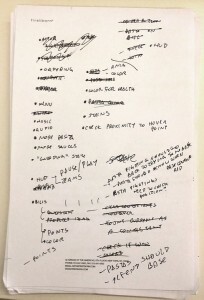 There’s a immediacy of having a to-do list or a page with notes accessible to you – the list is always next to me, on my desk – is something cannot be matched using a computer. It’s also easier to take my notes to a meeting, and add to-do items on the spot. The list normally starts as a small list of top-level topics – a website’s main areas, for example – and then I start adding sub-items to it, increasing the list size and depth. 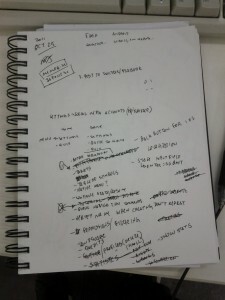 As the project approaches its completion, the list typically grows massively, until it spans around 3-6 pages of items. I mark tasks as done by striking over them (I like seeing that), and from time to time I remove them altogether. Normally, by the end a project, the list size has decreased almost to its original length, since tasks are done and I have OK’d each sub-area of the project. I find this to be the perfect approach for me for project lists. Editing is very easy, since I don’t have to use the mouse to navigate the document, add, or remove tasks; sharing is a snap, since anyone can view or even edit a Google Docs document I share with them; and it’s as flexible as it can be, since I can always add new items with information, or links to websites. Recently, however, I’ve come to resent that approach a little bit. It seems almost silly that, with the abundance of websites focused in to-do and task management out there, I can’t find anything better than a text editor for task maintenance. Asana, for example, seems to be a great task management tool. I’ve used it recently both for personal projects and for projects at work. I hated it, due to both personal quirks – I can’t create hierarchical lists, for one thing – and productivity issues – you can’t assign the same task to two people (which makes sense for cross-platform projects, since a feature has to be implemented twice). 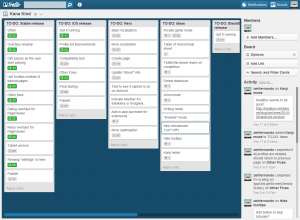 Trello is the one I used for Kana Mind. I tried very hard to like this, and while I used it without too much trouble, and seeing little green squares popping up when I accomplished certain groups of tasks was very satisfying, the lack of flexibility was still a hindrance. I’d have preferred to have a single, hierarchical list. Workflowy is a service I feel I should love; it has a very similar workflow to having a hierarchical list in Google Docs, and the ability to hide accomplished tasks is pretty nice. It’s very limited, though, so it feels more like a downgrade. Overall, I get the feeling that online task managers like that are created more with management in mind, rather than task organization. It’s great for a project manager to know the state of the project if his or her minions are reporting properly using the tool. However, for a developer wanting to get things done, those feel more like clutches to me. Each of us will have their own mental model of how they should accomplish their tasks. For me, what works is having a huge, flexible, easily editable list of things and ideas, but also having an easily-accessible list. For now, it seems I’m stuck with Google Docs and paper notes. It’s a workflow in which marking things done and throwing things away and starting anew is maximized, but one that helps me accomplish more and even feel better about it. You should have your own to-do lists, is all I’m trying to say. I’ve thought a lot about making my Chrome home screen a google docs list, myself. But find it to be a little imposing/stressing when I’m not in work-mode. zé, para listas rápidas eu uso o OneNote, e para listas de tarefas de projetos eu uso o acunote.com (tem integração com o google apps) pra listar e gerenciar tarefas, mas não é preso ao formato project, ele é mais focado no scrum, ele permite ate 3 níveis de hierarquia, tem gráficos de burn down, previsões, estatísticas, etc.. já testei algumas dessas opções que você listou mas eu tb sinto falta de hierarquia, e o acunote da pra abrir pro cliente pra ele enxergar o progresso… a parte de anotações rápidas o OneNote é bom pra colocar rich content, recortes de sites, imagens, rabiscos, com mais facilidade que o Google Docs que usei bastante tempo mas era um parto pra inserir uma imagem inline ou fazer uma anotação via drawing..